The Gallery widget makes it easy to display a photo gallery or slideshow in your blog’s sidebar. 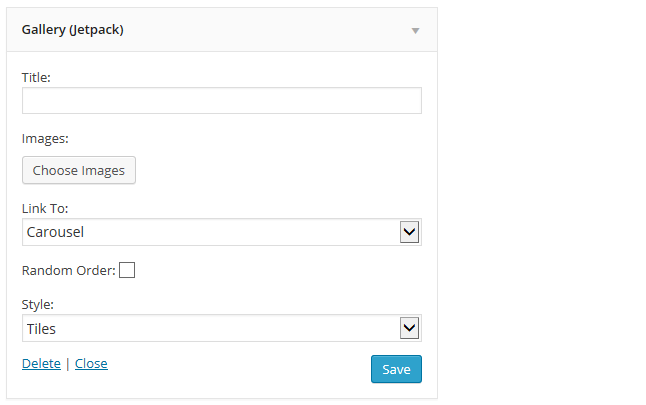 It is added Appearance > Widgets when the Extra Sidebar Widgets module and Tiled Galleries module in the Jetpack plugin are activated. To insert a slideshow you need to enable Jetpack’s Slideshow module. Choose Images: You click on Choose images to upload images from your computer for your gallery or slideshow. Link to: Controls what your images are linked to. Carousel: Links the images to a full-size carousel that allows visitors to scroll through the gallery one image at a time. Random order: when you check this box the images are displayed in a random order in the gallery. 1. Add the Gallery widget to the desired sidebar. 2. Click on Choose Images. 3. Click on Select Files and upload the images from your computer. Or click on Add to Gallery to select and add images that are already in your Media Library. 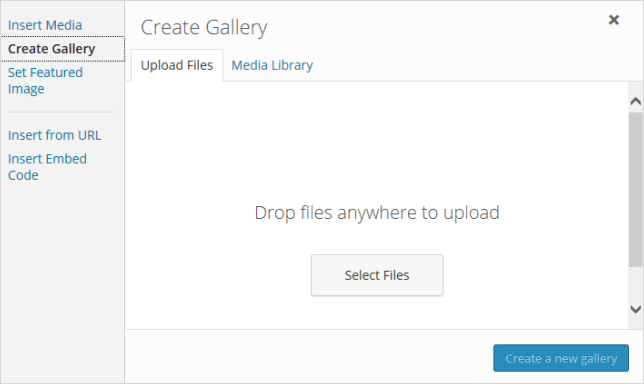 Click on Add to Gallery button once you have selected the images from your media library. 4. 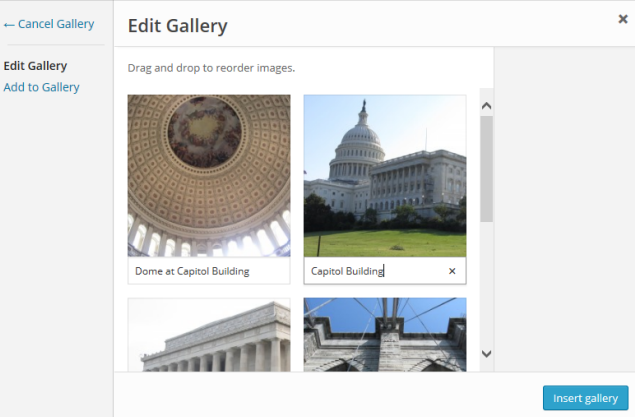 After you’ve uploaded or added all your images, add a caption, or drag and drop to reorder them and then click Insert Gallery. 5. Select your preferred Link to option. 6. Select your preferred Style. You must be using either “Allow search engines to index this site” or “Discourage search engines from indexing this site” in Settings > Reading to use Tiled Galleries. You can’t use Tiled Galleries if your blog is using one of the private options in Settings > Reading.